Cooking.com is an innovative and entertaining way to shop for cookware and kitchenware products, as well as search for recipes, menus, and member-submitted cooking content. Cooking.com offers a wide selection of products from brand like KitchenAid, All-Clad, Cuisinart, Wusthof, Le Crueset, Calphalon, and many others in the categories of tableware, cookbooks, barware, BBQ and patio supplies, cutlery, appliances, cookware, serveware, linens, commercial kitchen appliances, and more. Cooking.com is also the place to go for cooking related gifts, recipes, sweepstakes, and an endless supply of cooking ideas. But before you begin your next food adventure, be sure to save with the latest Cooking.com discounts, Cooking.com promotions, and Cooking.com coupon codes, found here at RetailSteal.com. Cooking.com provides shipping in the US, US Territories, APO, and FPO addresses. See site for more details. 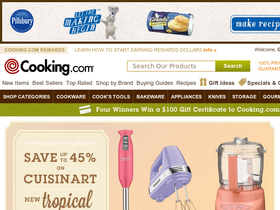 Shop online at Cooking.com and enjoy a $40 discount on your order with this coupon code. Code applies on orders of $100+. Shop at Cooking.com and enjoy $30 savings on orders $300+. Click here for code. Save $20 on purchases of $200 or more online at Cooking.com today when you enter our coupon code at checkout. Shop at Cooking.com and enjoy $10 savings on orders $75+. Click here for code. Shop at Cooking.com and enjoy 15% savings on your order. Click here for code. Use our coupon code online at Cooking.com today to enjoy 10% savings on all purchases. Shop at Cooking.com and enjoy free shipping on all orders. Click here for code. Shop at Cooking.com for a limited time to save up to 50% on the simply calphalon sale. Click to find great savings. Check out the products on clearance at Cooking.com and save up to 80% on brands like Hamilton Beach, Rachel Ray, Le Crueset, and more. Click here to check out up to 65% savings on All-Clad cookware from Cooking.com. Take $50 off this KitchenAid Pro Line at Cooking.com. Click here to shop this discount. Click here to shop for the top 25 items under $25 at Cooking.com. Shop and save today on brands like Farberware, Paula Deen, Cuisinart, and more. Shop at Rachael Ray Store today and save up to 45% on select Serveware sets. Click link to shop. Get a 10% discount with this code at the Rachael Ray Store. Click link to purchase. Save up to 50% on select knife sets at The Rachael Ray Store. Click link for savings. Shop at the Rachael Ray Store and save $10 on select skillet sets. Click link to purchase. Save 69% on a Rachael Ray Magazine subscription when you buy it online. Click link to buy.